Thanks Jay and Ron, i`m still kickin. Going to park the van, rock hit the wind shield and it looks like a spider web and the tires are about worn out plus the brake line and i think i`m all done fixing things where i have to lay down . Normas mother is getting a newer car so she is giving us her old one which is a pretty nice car a Dodge Intrepid so we will drive it for the winter anyway. Feeling a little better thanks for the prayers guys. Glad to hear buddy. Thats good news all around. Thanks buddy, Norma thinks i had a small stroke, i kinda over did it raking leaves too. Well if that's the case, you better get to a doc ASAP! Don't mess with stuff like that, my friend. What Jay said! Don't fool around with stuff like that. I put off going to the Doc and it almost killed me. We need you around to fend off the Hostiles, if they get past you, they'll be all the way to Kentucky before those southern boys can beat them back! I know one thing i`m like a beached whale when i get on the ground, had a heck of a time taking that prone shooting picture. Ok it looks like you need some R&R after the past week of guard duty! I'm sure Norma could use it too!? As for the van take it to the Motor Pool ! Thanks Gunny, there is a guy in the country that works pretty cheap was going to take it there but going to hold off for a while. Yea Norma puts her time in with my shenanigans alright. Dang! 6 pages...Leverguns record......and Pitchy, YOU made it happen. Thanks Six, blood pressure is good i`m just over weight and outta shape. Now lets get back to M1 Garands, i got one more picture in mind but it is turning cold and windy for tomorrow so prob. next week. We need more pics of others and they`er Garands. I will post a pic with mine when I get home. It's not gonna hold a candle to Pitchy's though. Now there! That's what I've been working towards. Ole Six just giving up and realizing all that cool stuff belongs with his buddy OldWin! I`d figured it would say General Patton. 29 degrees and windy here this morn so i`m guarding the stove. Only a half dozen flakes up here Todd, lots of wind . Got a neat 10 inch bayonet coming made by Oneida, i believe its original and if so a real prize . Won`t be here until end of week. Looks good bro........who are you calling? General Eisenhower? Patton? Admiral Nimitz? St. Adolf? Comrade Stalin? Thanks Six, this reenactment stuff is kinda fun. 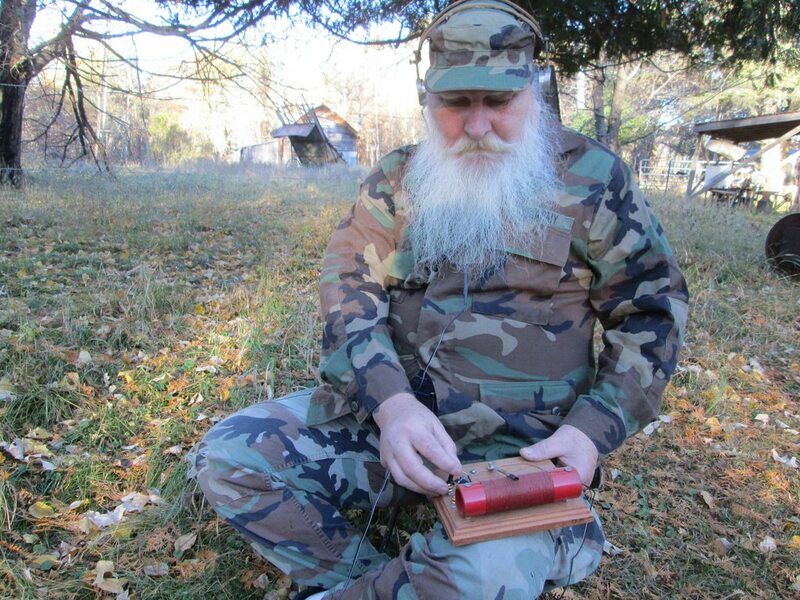 Can`t call anyone on a crystal radio bud, just used for listening too propaganda. Now we all know that Pitchy is OSS. Look at that beard! I'd say he is making contact with some underground forces after parachuting in behind the lines. Obviously a highly classified mission. It could be anything with this American Hero! Just between you and me that`s not a radio but a decoder, i`m trying to decode all the garbage be sent across the airways by the liberal nut jobs then inform the Trumpster. I think you'll need a bigger unit!.......a lot bigger. Did Norma put ya up to that. Oh man, that's bad........so bad! I see your done napping. Feel better? We went to them, in Virginia. I so hate traveling. The last night we stayed at a motel cause it was close to the airport. About 2am, we woke to a woman screaming bloody murder. She went running by the room still screaming. A woman came out and asked if she was ok. She said she was being beaten and he was coming. Didn't hear any more after that. First, I'm unarmed, like a good subject. Is it a ruse to get into someone's room? Is the male "agressor" armed? While I applaud the woman wanting to help, she was either armed or very stupid. It's a shame this is what our society has become. The rest of the time we stayed at my son's. I was plenty armed then. Next month they are coming to our place for 2 weeks. You did right young man! Not knowing all of the particulars is a disaster for you getting killed. As we all know, domestic fights are the most emotional and unless you could have made a definite decision, it's best to just look and see how it unfolds before you jump in. Do we hear 7 pages? I have 6 pages,...6 pages,...6 pages...will someone's give me 7. Thank's bro. It felt wrong not helping, but there were too many red flags flying. Ole Six has too many cool guns I haven't got yet. Well you two, quit gabbing and post more Garand pics like ya promised and maybe someone else will post pictures instead of listening to this love hate relationship you two have, just kidding. And Jay ya done the right thing imo. Well there! We been put on notice! Ok buddy, I will see what I can do today. A little i`ve learned about tightening up a loose gas cylinder, seems a lot of people peen using the ball end of a ball peen hammer the splines in the barrel slightly to tighten things up. I also read which i think might work quite well is to remove the front sight and drill and tap a hole in the area above the spline and put two set screws in it. Tightening the set screw would not only tighten it up but also would pull up on the tube making a better seal around the gas port. I have a little play in mine and am considering the set screw option along with a light peen. I'm not sure how much accuracy is affected in the real world. If you aren't shooting matches, with match ammo, and just shoot for enjoyment. I think the M1, like the M14 stays tighter, longer, if you don't disassemble it too often. I think if it was me, I'd go the peening route first. I would try and not permanently alter anything. The parts supply isn't what it once was for our grand old rifle. I agree with ya about taking the gas cylinder off to much, mine is pretty tight but has some side movement of the sight. I`m sure it would be just fine for as long as i live but i thought a discussion about it would be interesting. A light peen would probably be the best method. OK...just rolled outta bed.......11:45.....whew! That's early! O ring won`t help with this issue Six, slight peen seems to be a common practice. I`ll probably leave mine as is . The peen process isn`t done with a sharp punch, the ball end of a ball peen hammer is laid between the splines and tapped on the other end with a hammer. The slight curve of the ball slightly swedges the edge in thus tightening it up, nothing extreme. Last edited by Pitchy on Tue Oct 23, 2018 12:31 pm, edited 1 time in total. Thanks for the clips Paladin very nice of you to send them, no need to send more or the bandoleers i have some of those. So as promised, I took time outta my busy "gettin ready for huntin season" schedule, and got you a couple pics. Cool beans Jay buddy, nice rifles and pics thanks. Yea....I like the staged photo designed to make me furious.......all those half magazine Winchesters which are rarer then hens teeth around here. Dammit.....I'm gettin me a buffalo coat to come visit you. Enough of this one sided shyt...YOU gettin all the neat stuff. Hey, for real, you look good with those guns....what's in the canteen? Why, Jim Beam Black, of course! Oh yeah, I forgot to take that off the wall before taking the pic. That's the older of my 2 half mag 38-55's. Don't sweat it buddy. You'd be sadly disappointed here. I ain't got nothin' that'd hold a candle to your stuff. You don't want some smelly old buffalo coat anyhow. So I'm wondering if Pitchy has been 'called up' to go defend our southern "border" ? This hord is getting bigger by the minute and Trumpster needs some help! Six can go with his BAR, I'll bring my ( gasp) AR10 ! Only guard duty i`m pulling is my own part of the country, i`m worried about what`s going to happen down there. I'll tell you what's happening down there.......all of the brown people are signing up for migration to Minnesota and I hear they all want to go where there's nothing but woods and lakes and they want a neighbor who knows how to survive by himself and can help them with cutting wood, the proper way to drink rum and Coke, make steam engines and ride Harley's and of course, be able to patrol their tent cities. You know anyone up your way like that? I took the M1-A out for some fresh air today. Nice day...about 65 and all sunshine. Nice wood pile bud wish that`s all i had to get up and yep you look battle ready in your shorts. That`s the look those brown people will be heading too. yea i`d be a little leary too. At least its not kilts. I have seen shorts & longies before, Pulaski NY salmon fishermen. People steer clear of those folks too! You'd fit right in up here, Jack. That's what people wear to a fancy night on the town. Well, when the weather cools off! Nice wood pile, by the way. And yeah, that'd be a little lean up here.